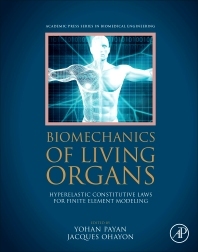 Biomechanics of Living Organs: Hyperelastic Constitutive Laws for Finite Element Modeling is the first book to cover finite element biomechanical modeling of each organ in the human body. This collection of chapters from the leaders in the field focuses on the constitutive laws for each organ. Each author introduces the state-of-the-art concerning constitutive laws and then illustrates the implementation of such laws with Finite Element Modeling of these organs. The focus of each chapter is on instruction, careful derivation and presentation of formulae, and methods. When modeling tissues, this book will help users determine modeling parameters and the variability for particular populations. Chapters highlight important experimental techniques needed to inform, motivate, and validate the choice of strain energy function or the constitutive model. Remodeling, growth, and damage are all covered, as is the relationship of constitutive relationships of organs to tissue and molecular scale properties (as net organ behavior depends fundamentally on its sub components). This book is intended for professionals, academics, and students in tissue and continuum biomechanics. Yohan Payan leads the CAMI team (Computer Assisted Medical Interventions) of TIMC-IMAG Laboratory. With an engineering background, his main research interests concern the biomechanical modelling of soft tissues. He received the 2012 Senior Prize of the French Biomechanics Society. During the last fifteen years, he has co-supervised 25 PhD students, written close to 300 papers and edited two books focused on biomechanics for CAMI. During the same period, he spent two sabbatical years in Chile (Univ. of Santiago) and Canada (UBC, Vancouver) and was invited as a keynote speaker in more than twenty international conferences. Jacques Ohayon received his MSc degree in Biomechanical Engineering at University of Compiègne (UTC) in France in 1982 and his PhD in Cardiac Mechanics in 1985 at the University of Paris 12 Val-de-Marne (UPVM). Since 2003, he performs his research at the Laboratory TIMC-CNRS UMR 5525 of Grenoble in the group Cellular/Tissular Dynamics and Functional Microscopy (DyCTiM). From 2006 to 2007 he was an invited senior scientist at the Laboratory of Integrative Cardiovascular Imaging Science at the NIH, USA. His current research interests are in biomechanics of atherosclerotic plaque, plaque detection, plaque rupture prediction, plaque growth and development of new clinical tools for imaging the elasticity of vulnerable plaque based on clinical OCT, MRI and IVUS sequences. It covers a large spectrum of biomechanical items with some very valuables contributions from reference authors in the realm of biomechanics !